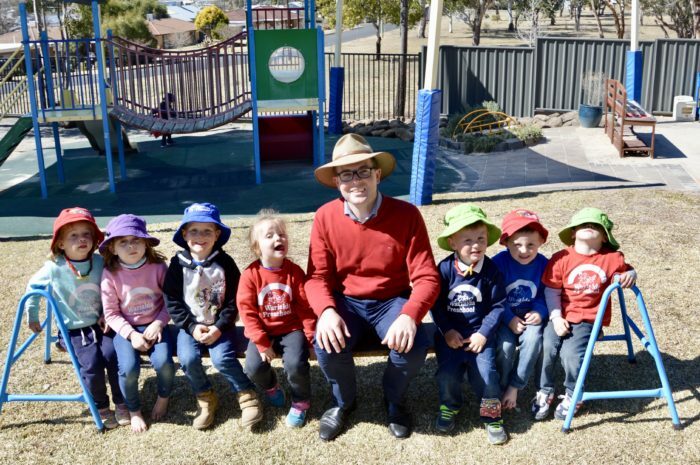 Northern Tablelands MP Adam Marshall, centre, with Warialda Preschool students Cate Barnett, left, Dakota Rose, Levi Taylor, Poppie McClymont, Reid Rose, Rylan Bostock and Ziggy Hall. TWENTY-FOUR community preschools across the Northern Tablelands have been given a big boost with much needed drought relief funding to help support struggling families, Northern Tablelands MP Adam Marshall announced today. Mr Marshall said $288,700 had been allocated by the NSW Government to the 24 community and mobile preschools in Uralla, Armidale, Glen Innes, Kingstown, Bundarra, Inverell, Ashford, Warialda, Bingara and Moree impacted by drought. He said the funding package would allow the preschools to assist families through means such as reducing fees, allowing more flexibility with travel arrangements and future-proofing services so they are more resilient and better equipped to cope in future. “Community preschools and those offering early childhood community services have been doing it tough in the drought too, and this funding will go some way to helping out those who are suffering, because we don’t want to see our littlest learners missing out too,” Mr Marshall said. “These drought relief payments will help support preschools support their families who have been affected by the drought. “The payments will be made this month, and they’ve been calculated to give more to those services operating in the worst affected drought areas but also with minimum payments based on enrolments of children. Mr Marshall said the payments ranged from $4,000 up to $25,500 for community preschool services across Northern Tablelands. “Funding has been allocated to services based on their enrolment numbers and location, and will be scaled according to the level of drought intensity,” Mr Marshall said. Mr Marshall said under that rationale St Peters Preschool in Armidale would receive $25,500, Gwydir Mobile Children’s Services $21,800, Armidale Community PreSchool $20,100 and Kindamindi Preschool $18,600. “Early childhood education matters. I believe it’s crucial because it’s the foundation upon which our children can keep building, so they can reach their potential,” he said. “Education changes lives, and to the families doing it tough out in drought affected areas, we want to help and we will continue to support you as much as possible through these challenging times. Mr Marshall said his government was doing the heavy lifting in an area they have control over, where it has primary responsibility for the community preschool sector. Minister for Early Childhood Education Sarah Mitchell said it was crucial the NSW Government continues to support families to ensure children always have access to top quality early childhood education, no matter where they live or what their circumstances are. Ms Mitchell said the government understood the numerous social and economic flow-on affects from the drought, which affect businesses and communities like those in the Northern Tablelands electorate. “Our goal is to help alleviate some of the pressure on families by supporting early childhood services where attendance may have dropped due to socioeconomic pressures, and also to boost service operators coping with additional challenges,” she said.